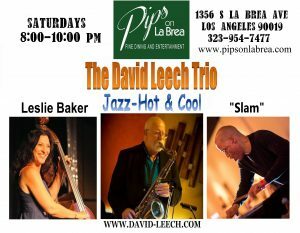 I looked forward to a night at Pips with the David Leech Trio 8-10 PM Saturday August 12. It worked out great! Look for me together with them again, same venue on September 16, 23 and 30. It’s on LaBrea just north of Pico. Sax, Bass and Drums!